Day 7: May 4, 2015. Our excusion this morning was a tour of Lindos. 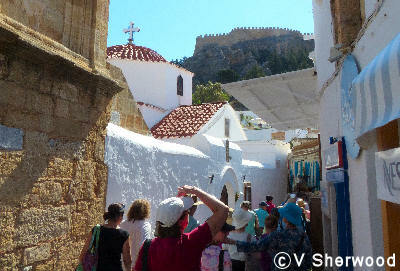 It was a long, hot hike up to the acropolis so I stayed down in the town. 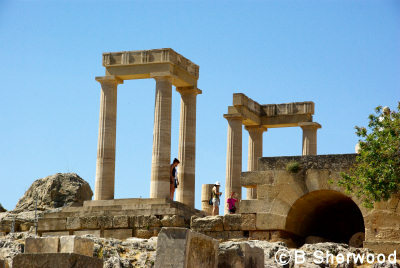 So all the photos of Lindos Acropolis are Bill's. 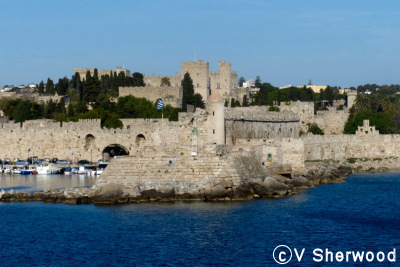 We had the afternoon free and our ship was still anchored in Rhodes harbour, so we walked around the old town with Greek, Roman, Byzantine, Crusader and Ottoman sites to see. Lindos is about 50 km south of Rhodes Town where our ship was anchored, so we took a bus there. This is the modern town crowned by the ancient acropolis which was fortified by the Knights of Rhodes (the Knights of St. John). 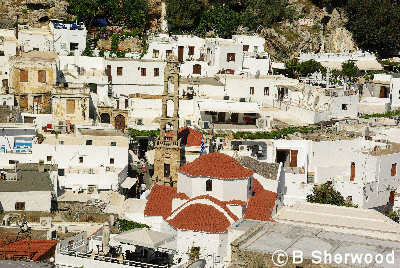 Lindos town with the Greek Orthodox church and tower. The church in Lindos town with the acropolis above it. 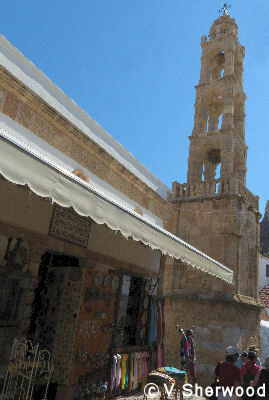 The tower of Lindos church. 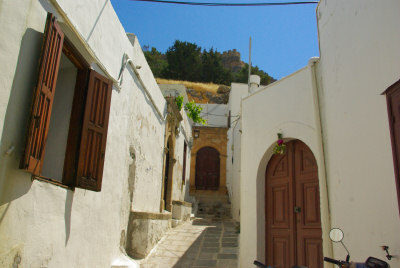 A street in Lindos town. 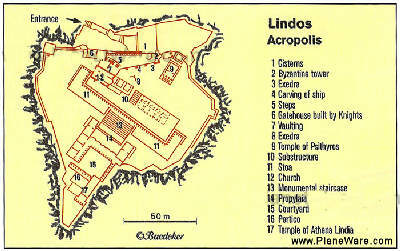 This is a map of the Acropolis of Lindos. 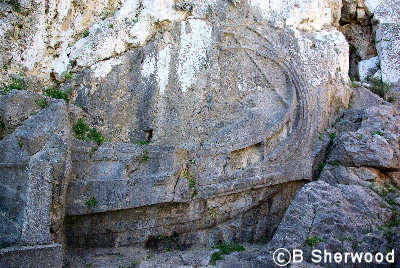 A ship carved in the wall on the way up to the acropolis. The castle or administration building build by the Knights of St. John on the Lindos Acropolis. 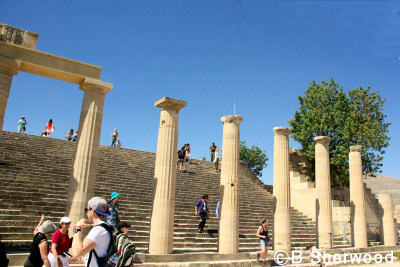 The magnificent staircase up to the Propylaea on the Acropolis. The Temple of Athena Lindia on the highest level of the Acropolis. 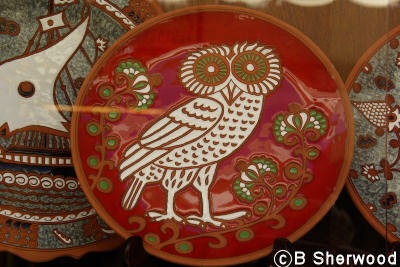 Pottery in a shop in Lindos town. The motive is Athene's owl, interesting because the main temple on the Acropolis is dedicated to Athene Lindia..Athene's owl was also stamped on the coins of Athens. 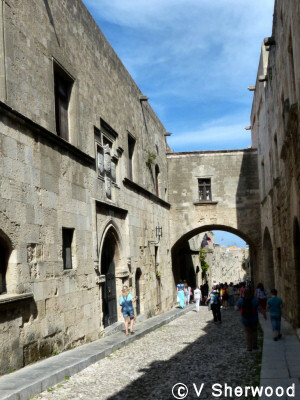 Rhodes Old Town is dominated by the walls and castle of the Grand Master of the Knights of St. John. The Old Town is the oldest inhabited mediaeval town in Europe and is a UNESCO World Heritage Site. 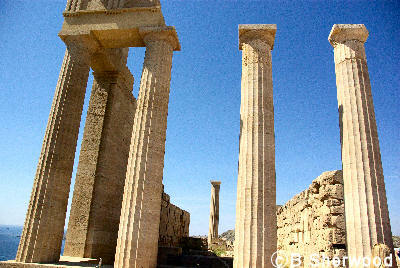 The Greek city was built about 400 BC. 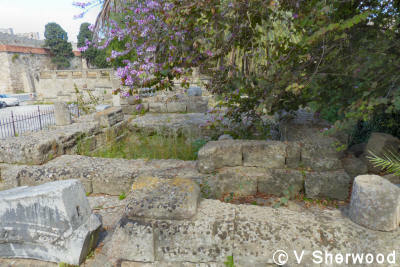 It was the site of the Colossus of Rhodes, one of the seven wonders of the world. Built around 300 BC, it stood for 60 years, then fell during an earthquake. Rome took control of Rhodes in 164 BC. 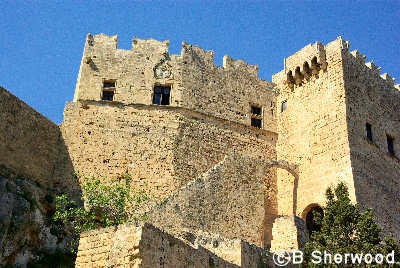 The Knights Hospitaler (Knights of St. John) captured Rhodes in 1307, fortified the town and made it their headquarters. They remained there until defeated by the Ottomans in December 1522. The Ottomans ruled Rhodes until they were defeated by Italian troops in 1912. 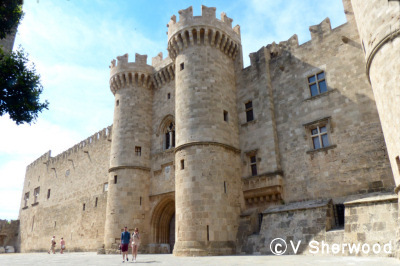 Rhodes officially became part of Greece in 1948. The ruined Byzantine church, Agia Ekaterini. 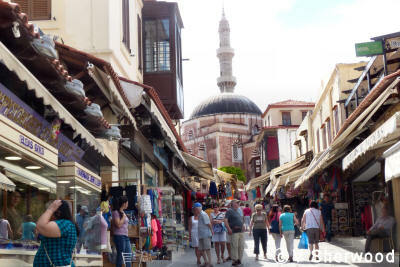 A shopping street in the Old Town. In the background is the Suleiman Mosque, built in 1522 and reconstructed in 1808. 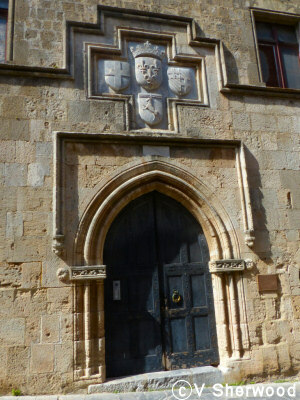 The Palace of the Grand Master of the Knights of St. John, also known as the Knights Hospitalers and the Knights of Rhodes. The order was founded around 1023 in Jerusalem to care for pilgrims to the Holy Land. Later they looked after wounded crusaders and became a military as well as medicinal force. The Street of the Knights is lined by inns where knights from different regions of Europe lived. The Inn of Provence dates from 1518.. 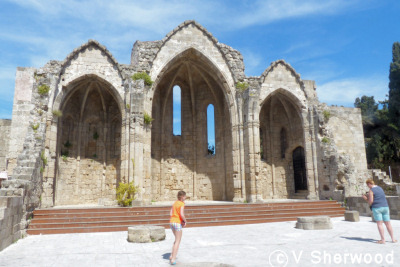 Ruins of the temple of Aphrodite in Rhodes Old Town. Earthquakes and bombing in World War 2 destroyed buildings built on top of the ancient ruins. 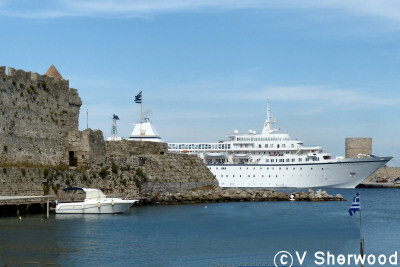 Our ship, Aegean Odyssee anchored in Rhodes Harbour..